Since iPhone 4S' launch on October 2011, many people fell disappointed (including me) because the hope for a full-fledged and completely redesigned iPhone 5, let alone the absence of some rumored features - a bigger screen, NFC, and a tapered design. 1.Incompatibility: iPhone 4S can play MP4, H.264, M4V and MOV directly without extra video conversion. But it is not compatible with the “outsider formats” like AVI, WMV, FLV, MPEG2, MKV, etc. So one has to change the formats of the incompatible videos to the compatible ones using some video converter. 2. Storage: Storage and memory have always been a major concern for iPhone 4 owners since the capacity is 16GB, 32GB or 64GB maximally. It takes much room to store a lot of videos on iPhone 4S. Also it is inconvenient if you execute file deletion every time once after finishing playing a video. 3. Sync: In order to transmit the videos from personal computer to iPhone 4S, one needs to use iTunes - the front end for Apple's QuickTime media player. That is to say, iPhone sync with iTunes on a Mac or Windows PC is required (except for iOS 5 though). These factors listed above will surely consume time and cause inconvenience to users. But there is a solution called iPhone streaming, and also a corresponding trouble shooter called Air Playit. Air Playit is a multimedia streaming application that helps all people live convert and stream videos and music to iPhone 4S from PC or Mac. It is free iPhone streaming software capable of reproducing audio video files in 320 different formats on iPhone 4S without the help of any third-party video conversion software or iTunes. It consists of two parts: Air Playit server running on the computer and the Air Playit App Client workable on iPhone (4S), iPad, iPod touch and Android phones. If video or audio files are included in the shared folder of the server, one can realize streaming audio video to iPhone 4S and play them immediately without waiting for conversion and sync at all. Here is a user guide on how to stream audio video to iPhone 4S that is even applicable to beginners. Please make sure the version (for Windows and for Mac) for streaming onto iPhone 4S you downloaded is matched with your home computer OS. Second, build your own music or video library on the server. 1. 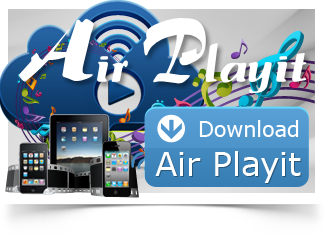 Run Air Playit Server on your PC or Mac. 2. Click "Shared Folders" and choose "Add Folder" to get ready for streaming to iPhone 4S. You can choose music files and movies as many as you can for streaming audio video to iPhone 4S. 3. Set permission for the added folders. All three use permissions (Admin, Kids and Public) are chosen by default, but you can change it at will. 4. Manage or change your audio video list. 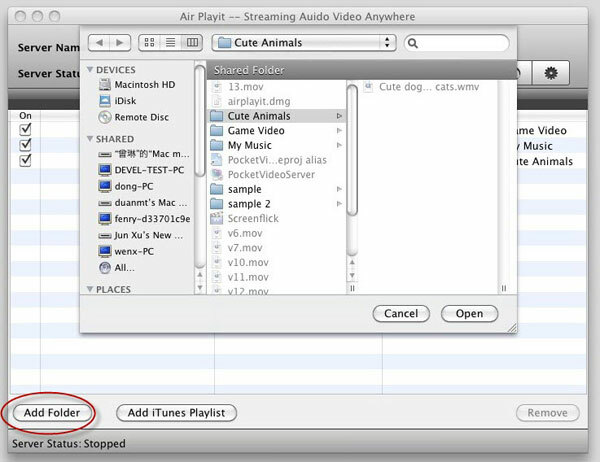 You can either remove the unwanted folder through "Remove Folder" button or add the audio video files directly from your iTunes through "Import iTunes Playlist" option. Then the basic operation on the server is completed. Third, start running Air Playit Client on your iPhone 4S. Both auto local network detection and DIY mode IP address input are allowed before you streaming audio video to iPhone 4S. Finally, play any music or video through streaming on iPhone 4S. 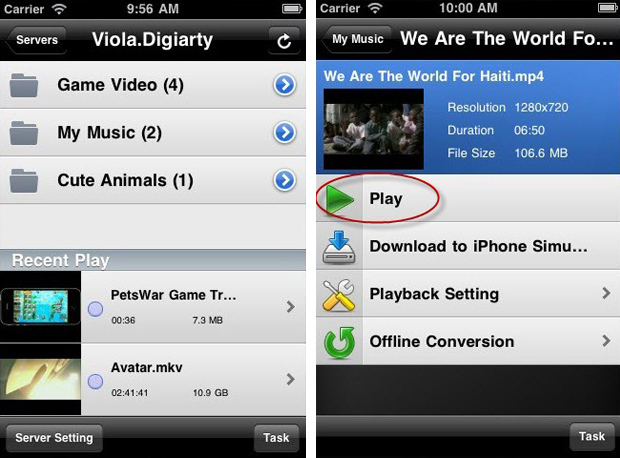 Find the video or audio file you want to play, click on it and play it on iPhone 4S directly without waiting for conversion. Air Playit will convert and stream the audio video data for you at the same time. Besides, you do not have to delete after finishing watching, because it takes 0 space in your iPhone! See, isn't it easy and convenient to stream audio video to iPhone 4S? Is it possible to watch Disney protected DVD movies on iDevice? Definitely yes! You can stream Disney protected DVDs to iPad iPhone as many as possible by virtue of Air Playit App and WinX DVD Ripper Platinum. Watch your HTPC video/music on iPad iPhone? Yes, Air Playit well serves the needs of people on business trip or commuting by streaming video music from HTPC to iPad iPhone.